On Pine Street looking south. 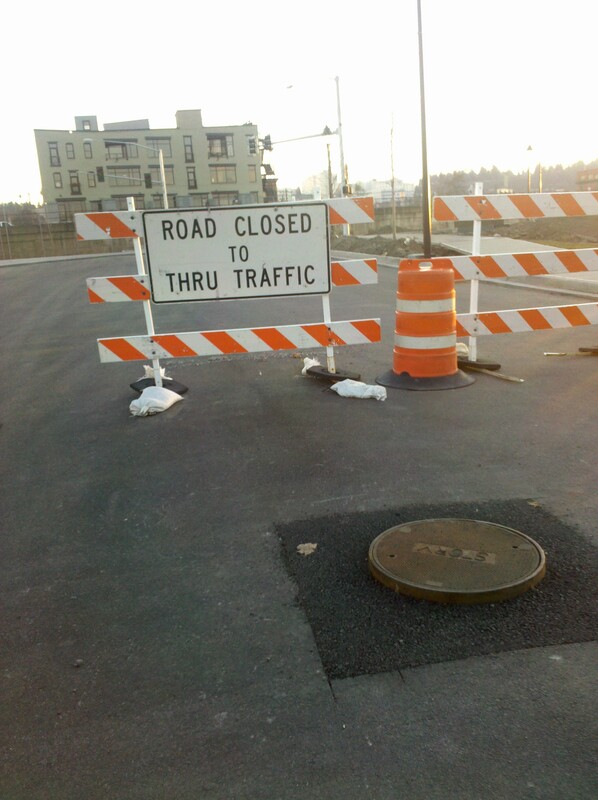 You can tell these streets will get one more layer of asphalt--look at that sewage access plate sticking up. 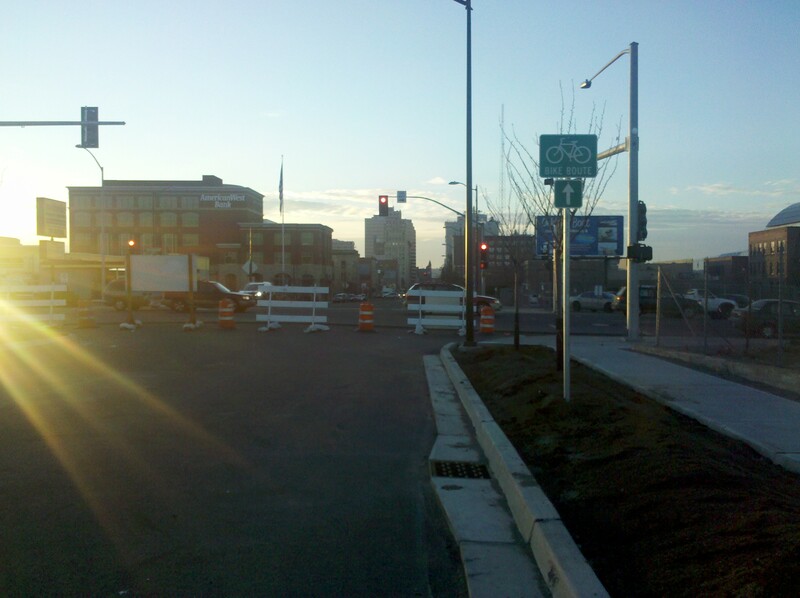 The new Martin Luther King, Jr. Way–the name for the extension of Riverside Avenue east of Division–isn’t open yet. So of course no one has ridden a bike on it yet. Hypothetically speaking, the light skiff of snow that fell in mid-December might have lured some wayward person on a bike to take a right off northbound Division onto the untouched snow. Said hypothetical cyclist might have gloried in the absolute freedom to ride anywhere in the street similar to Spokane Summer Parkways, unfettered by the need to look out for larger vehicles. This hypothetical bike rider could head east to Sherman, where the new street curves northward to connect with Spokane Falls Boulevard near the WSU Spokane Student Bookstore. 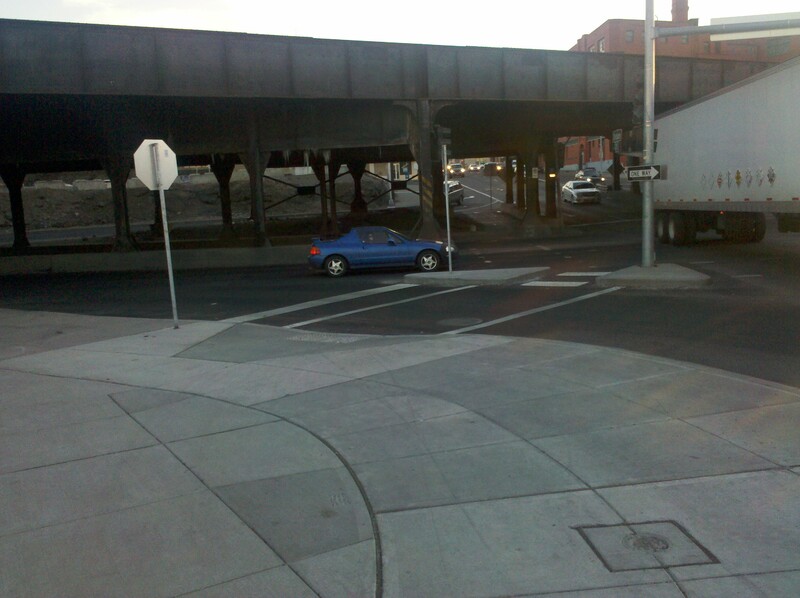 That’s currently a four-way stop–someday to have a traffic light, or so I hear. Drivers aren’t expecting any traffic out of a closed street, so obviously if someone were coming from that direction, it would behoove that person to exercise due diligence in navigating the intersection. Should this same nonexistent person have wanted to try MLK Way the other direction, westbound, it would be wise to note that the street lacks its final lift of asphalt so the sewer access plate projects up a good three inches or more, making the usual right tire track position a bad choice. Of course, with a light skiff of snow this would be pretty obvious so no disaster need occur. Looking west at the intersection of Martin Luther King, Jr. Way (Riverside west of this point) and Division. It would be tricky to come out of a closed street and re-enter regular traffic, of course. If this hypothetical rider headed west on Martin Luther King, Jr. Way needed to end up heading eastbound on Sprague two options exist. If, however, this hypothetical rider wanted to take full advantage of the flexibility a bike allows, switching between vehicle and pedestrian modes, a great route might present itself that’s far easier than dealing with the one-way street issues and car commuter traffic. This is the signage you'll see on the right (east) side of the street just after you come under the railroad tracks at Sprague heading northbound on Division. 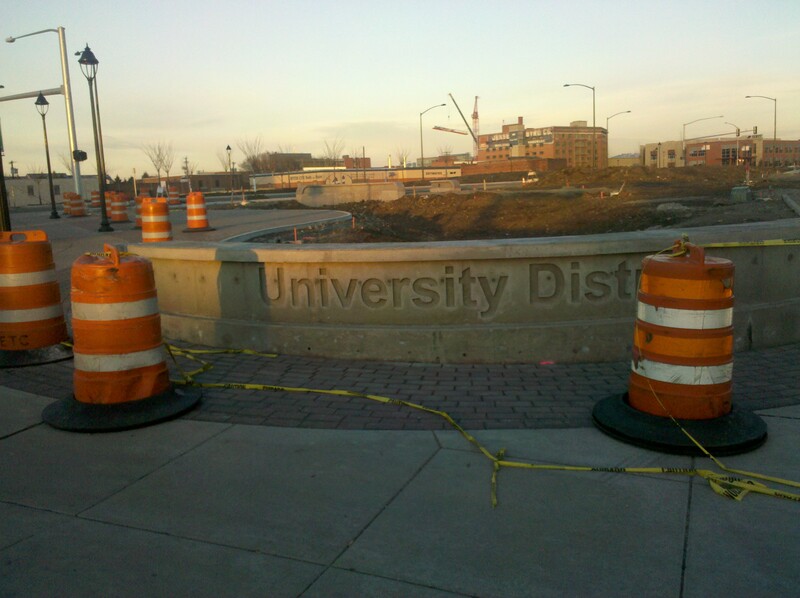 This will be a nice little public plaza when it's finished. The bike advantage: Instead of having to loop around the one-way streets, just take to the sidewalk (the University District signage above is to the left of this photo), then get back into the street to head eastbound on Sprague. Drivers can't change modes the way we can. Thus Martin Luther King, Jr. Way, with its complete streets design of sidewalks, planting strips, and lanes where bike lanes will be striped when the street is finished in spring 2012 might represent some stellar virgin riding along the south edge of the Riverpoint Campus with no cars to contend with. So pleasant, in fact, that this little experiment could have been repeated multiple times in both directions long after that tiny bit of snow melted.